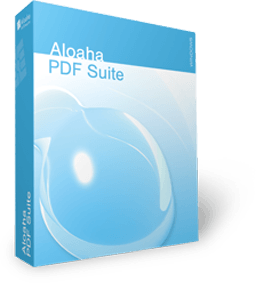 Aloaha PDF Suite was developed as the ultimate PDF Creator to create your vector based, high resolution PDF Documents. Your PDF Documents are just one click away. Just press the print button and get your PDF as file or email. PDF is the ideal electronic package to contain everything from spreadsheets, presentations, and brochures, to photographs, rich graphics, and more. Creating PDF files is as easy as clicking a button using the Aloaha PDF Suite. Aloaha PDF files preserve the look and integrity of your original documents, and you can share them with anyone electronically, regardless of hardware and software platforms. PDF Security is given by 40 and 128 Bit encryption and digital signatures. PDF Signer and PDF Editor are included in the Aloaha PDF Suite Pro package - no extra license costs.